UPDATE: "Snow White and the Huntsman" Trailer Calls and Raises "MIrror, Mirror"
UPDATE: Yesterday saw the arrival of the new "Snow White and the Huntsman" banner, so naturally today we get the trailer, and we have to say, it far exceeds even our most generous expectations. Charlize Theron appears to be having a blast as the vampiric Evil Queen, the colors pop, the action looks great... We're impressed. The other Snow White pic, "Mirror, Mirror, " starring Lily Collins is going to need to step up its game. Kristen Stewart's "Snow White" movie has dropped a darkly dramatic poster, just two days after Lily Collins' take on the classic fairy tale announced a title change. This Snow White Showdown is officially on, people. 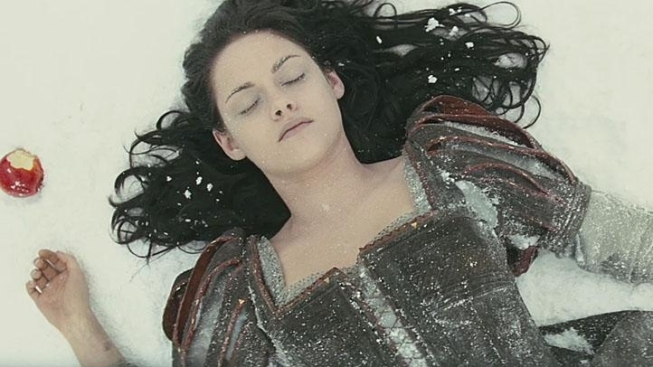 Stewart's version, "Snow White and the Huntsman" finds our hero taken out into the woods to be killed by a huntsman (Chris "Thor" Hemsworth) at the behest of the Evil Queen (Charlize Theron). What EQ doesn't realize is that the Huntsman's been training Snow in the art of battle. What's got us most excited about this version is the cast of dwarfs: Ian McShane, Toby Jones, Nick Frost, Ray Winstone, Eddie Izzard, Bob Hoskins and Stephen Graham. Directed by Rupert Sanders, it appears to be a gritty version of the tale, much more in line with the version told by the Brothers Grimm a couple hundred years ago. This is in sharp contrast to Collins' vehicle, which earlier this week finally settled on a name, "Mirror, Mirror," which on the one hand we like. But from a marketing standpoint, we question the wisdom of not leveraging the "Snow White" brand. This film comes from Tarsem, whose "Immortals" is coming out Friday, and appears to bear his signature flair for intense colors, as well as a more Disney-esque vibe, with Armie Hammer as Prince Charming and Julia Roberts as the Evil Queen. "Mirror, Mirror" already put the pedal down on production to get into theaters March 16, some 10 weeks ahead of "Huntsman"'s June 1 date, so why are they now surrendering the name?